By the early 1700s Edinburgh was one of the most densely populated places on earth, and one of the most squalid. What is now called the Old Town comprised tightly packed high-rise tenements in which rich and poor lived side by side: or, more commonly, those who could afford it chose to live on upper floors where the air was a little fresher, leaving the lower floors to the poor. On the positive side, it could be argued that these conditions helped spark the intellectual flowering of the Scottish Enlightenment. On the negative side, "Auld Reekie", as it was known to its residents, was hardly a desirable place to live. The turning point came when a tenement simply collapsed in 1751. A survey that followed revealed that much of the city was suffering from severe neglect, and the result, the following year, was a set of proposals for a new suburb to be built on open countryside to the north of the existing city. The idea was a ambitious one: to build a "splendid and magnificent city" attractive enough to draw back to Edinburgh at least some of the Scottish aristocracy who had increasingly wintered in London since James VI of Scotland had also become James I of England in 1603 and moved south: a trend that only increased with the Act of Union and the dissolution of the Scottish Parliament in 1707. A competition was launched for the design of the new aristocratic suburb, and and in August 1766 the 27 year old architect James Craig was declared to be the winner. His original plan for "New Edinburgh" centred on a large square and had streets radiating from it in the pattern of the Union Jack. While the detail of his plan found favour, its general layout did not, and by July 1767 Craig had amended the overall plan to a grid to be known as the "New Town". Building started immediately, and what can be seen in Edinburgh's New Town today can largely be traced directly back to James Craig's amended plans. The New Town that emerged over the years that followed was every bit as magnificent as the city fathers had hoped. Despite this, it largely failed to persuade Scotland's aristocracy to return from London. Instead it proved an irresistible draw for anyone living in the Old Town who could afford to move, with the result that most did so, leaving the old heart of the city to decay further into slums and squalor. While today's visitor to Edinburgh can appreciate the overall plan of the New Town and the magnificent exteriors which were built, it is much less easy to get any sense of what life within a New Town house would have been like for those who chose to live here. 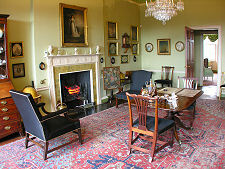 This is the aim of the Georgian House, which since 1975 the National Trust for Scotland have opened to the public as a typical example of a New Town interior in the years around 1800. 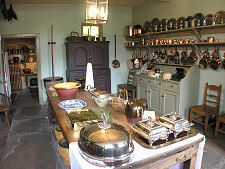 In many ways it therefore forms a pair with Gladstone's Land in the Old Town, which the NTS maintains as an example of Old Town life just before the migration of the wealthy to the New Town. The north side of Charlotte Square was designed in 1791 by the Scottish architect Robert Adam. When originally built it had a grandeur and symmetry of form that would not have looked out of place as the frontage of a palace, despite the fact that it actually comprised 11 terraced town houses, the interior layout and design of which were very much up to individual owners. Over the following century the unity of the facade became disrupted as some owners chose to alter windows to conform to Victorian fashion and a number installed windows in the roof. In the 1920s much of the north side of the square was acquired by the 4th Marquis of Bute, and by the end of the 1930s he had restored the facade to something much closer to Robert Adam's original. In 1966, ownership of Nos. 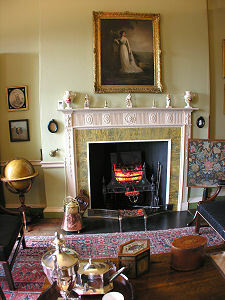 5, 6 and 7 Charlotte Square was passed to the National Trust for Scotland. 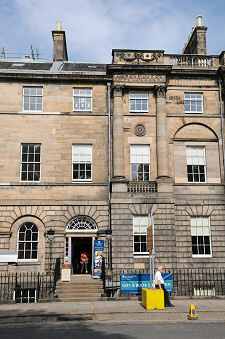 No.6 Charlotte Square, also known as Bute House, became the official residence of the Secretary of State for Scotland or, since 1999, of the First Minister of Scotland. 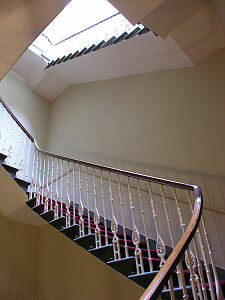 No.5 Charlotte Square had been leased by the National Trust for Scotland as their HQ since 1949, and after they became owners it continued in that role until they moved across the square to No.28. 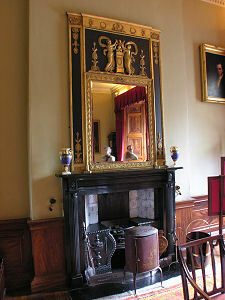 The third of the National Trust for Scotland's properties on the north side of Charlotte Square, No.7, was for many years the premises of an antique dealer. When the lease expired in 1973, the NTS decided to convert the ground and first floors, together with the basement, into a typical New Town house of the Georgian era. 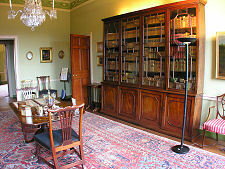 The Georgian House first opened to the public in 1975 and the collection of everyday objects on display has continued to grow and evolve as new acquisitions have been made. 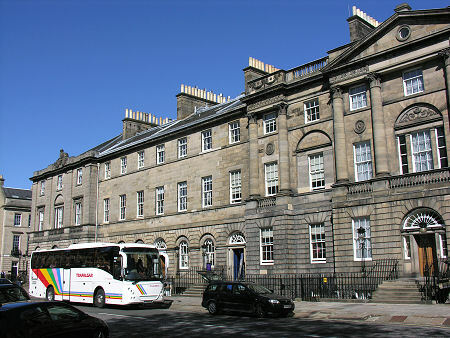 When viewed from Charlotte Square, No.7 occupies three bays of the north side, just off the the left hand side of the centre of the facade (the centre itself being home to No.6, Bute House). Within the grand front entrance is a lobby, and beyond that the stair hall, home to the reception desk. 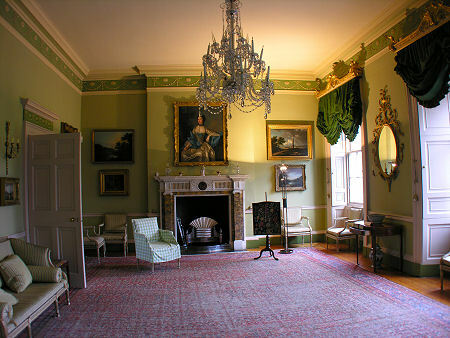 The focus of the house today, as it would have been when it was first built, is the first floor and, in particular, the drawing room, by far the largest room in the house, occupying its full width at the front of the house overlooking Charlotte Square. 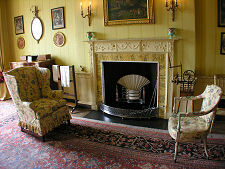 If the drawing room was the focus for the public life of the residents of No.7, the back drawing room or parlour was where they would have spent most of their time when not entertaining. Here the effect is more comfortable and informal, as are the views from the window, over the gardens and towards Leith and the River Forth. 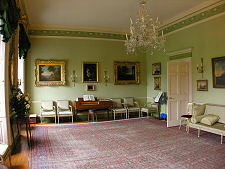 The ground floor is also home to two main rooms. 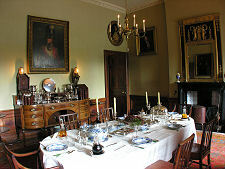 At the front is the dining room, home to the only traditional black marble fireplace to have survived in No.7, as well as to a superb collection of dining furniture, including a fully laid-out table ready and waiting for the guests to arrive. 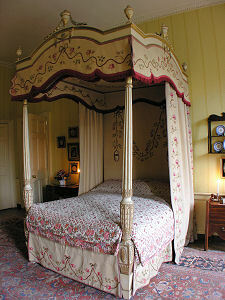 At the rear of the ground floor is a bedroom, complete with a magnificent four poster bed. This may seem odd at first, but adhered to the well established Edinburgh custom of placing the bedchamber where it could offer the best view of the garden. At the foot of the stairs leading to the basement of No.7 is the bell board, a range of 14 bells on their typically Scottish coiled mountings, intended to ensure that the servants who inhabited the lower reaches of the house would always be on call. 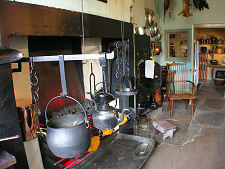 Nearby is the superb kitchen, complete with a magnificent range that, in full operation, would have required the maintenance of no fewer than three separate fires. Also on the basement level is an audio-visual display of life in a New Town house at the beginning of the 1800s and an education room. But as ever it is the detail which enthralls. 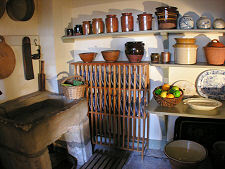 Opening from the basement corridor is the china closet, complete with contents derived from an inventory of a similar closet of a house elsewhere in the New Town written in 1826. 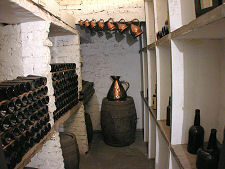 And the scale of the entertaining likely to be undertaken by the residents of No.7 becomes clear from a glimpse into the extremely well-stocked wine cellar.